From being a young boy my Mother’s family, the Lakes, bought me copies of the charming animal stories by Beatrix Potter, so I am very familiar with them. I am particularly fond of Jemima Puddle-duck, Squirrel Nutkin and Hunca Munca from ‘The Tale of Two Bad Mice’. Since early childhood, I have also gathered a number of friends who also love this lady’s work, including Sara, who has a particular fondness for Mrs. Tiggy-winkle. 150-years-ago today, Beatrix Potter was born in London and in this commemorative year her characters and illustrations are being featured on Royal Mail stamps and Royal Mint fifty-pence coins. So, it would seem an appropriate moment to mention a ‘Beatrix Potter’ inspired illustration that I was commissioned to do, whilst working in Carlisle, in April 1997. When I worked with Sara and many of my other friends, on such publications as Cumbria Life and the Cumbrian Gazette newspapers, I was often asked to produce illustrations for the advertisements or editorial features. On one occasion, I was asked if I could draw an illustration, which was to feature on an advertisement for a very prestigious and beautiful hotel in the Lake District – famous for the red squirrels that live in the grounds. 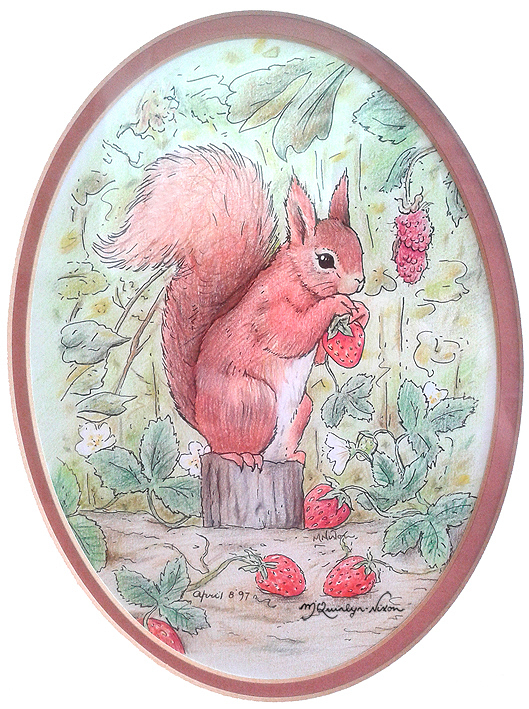 The clients asked if I could do a red squirrel pencil or watercolour illustration on a Beatrix Potter theme. I was keen to try and immediately set to sketching some red squirrels in the delicate fashion of this famous lady that has inspired me for many years. I have in no way captured the beauty of her work (I had a very short deadline to do the illustration by, as it happens!) but at least I have tried to capture the essence of her unique style and flair. NB. Please note that the picture (above) is framed and this image shows some slight distortion caused by reflections on the glass.